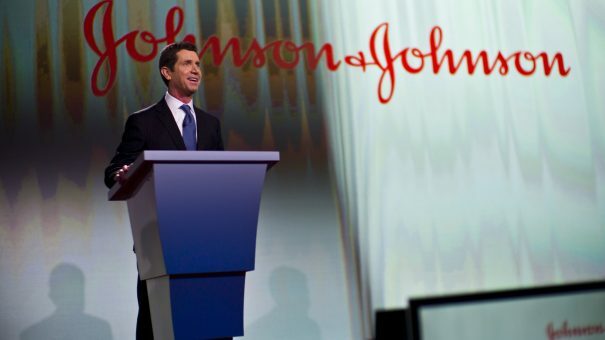 Johnson & Johnson (J&J) has kicked off results season with a downbeat forecast for the year as competition to some of its top products starts to have an impact on revenues. J&J says it is expecting 2019 product sales in the $80.4 billion to $81.2 billion range – around $1 to $2 billion shy of average analyst forecasts. The shortfall is being attributed to deepening biosimilar competition to biologic blockbuster Remicade (infliximab) for inflammatory diseases, as well as the anticipated start of generic competition to its big-selling prostate cancer therapy Zytiga (abiraterone acetate). For now, all is looking solid, with annual revenues rising almost 7% to $81.6 billion, and pharma growing more than 12% to $40.7 billion thanks to a good performance from Zytiga, inflammatory disease treatment Stelara (ustekinumab) and other cancer drugs notably Darzalex (daratumumab) and Imbruvica (ibrutinib). Stelara benefited from a recent approval in Crohn’s disease, with sales up 29% to $5.16 billion, while follow-up Tremfya (guselkumab) started well in psoriasis despite a tough competitive environment, adding $544 million in the year. There were clear signs of weakness, however. Remicade sales were down almost $1 billion compared to 2017 at $5.3 billion, thanks in part to a pair of biosimilar rivals but mainly due to discounting, with J&J still claiming a 93% market share of the US market. Meanwhile novel oral anticoagulant (NOAC) Xarelto (rivaroxaban) was flat at $2.5 billion for the full-year – but down 14% in the fourth quarter due to pricing pressure in the US. Zytiga is still romping away, with a 40% gain in the year to $3.5 billion, in part because of the results of the LATITUDE study in metastatic high-risk castration sensitive prostate cancer, which firmed up its competitive profile against arch rival Xtandi (enzalutamide) from Pfizer. However, a defeat in a patent infringement lawsuit last year has made around $1.8 billion of US sales of the drug vulnerable to earlier-than-expected generic competition, with J&J saying earlier this month that there were already four copycat products on the US market. Fourth-quarter sales of the drug in the US fell 13%, and J&J now says it thinks competition could have a $3 billion negative impact on 2019 sales. J&J’s consumer health business improved slightly, up 1.8% to $13.9 billion for the year, but medical devices continued to struggle with a 4% slide to $6.67 billion. The company’s expenses have also escalated in the wake of a series of lawsuits over allegations that its talc products are linked to cancer.